Russian writer; born in the second half of the nineteenth century. He became notorious through his history of Russian legislation dealing with the Jews, entitled "Istoria Russkavo Zakonodatelstva O Yevreyakh," of which only the first volume, covering the period from Alexis Mikhailovich (1649) to 1825, has appeared. His work is anti-Semitic in tendency. Although Golitzyn assumes that his compilation will be of historical value to students of the Jewish question, he does not conceal his prejudice against the Jews, and he even admits in the preface that the question, because of its vitality and urgency, can hardly be studied in a cold, impartial spirit. In speaking of the attitude of the Russian Jews toward the invasion of Napoleon, he belittles their patriotism and, in spite of direct testimony to the contrary (see Alexander I.; Russia), even accuses them of selfish motives. Referring to the attempts of the Senate under Elizabeth and Catherine II. to revise the laws concerning the Jews, Golitzyn neglects the facts which made such attempts necessary, and ascribes the action of the Senate to the intrigues of the Jews. The work is a compilation from the writings of Orshanski, Leontovich, Dobrynin, Bershadski, Nikitin, Derzhavin, Levanda, and others, supplemented by speculations of the author utterly at variance with the facts. Count Golitzyn, however, styles his work original, and claims, for instance, that Bershadski's "Litovskiye Yevreii" is strongly in favor of the Jews. 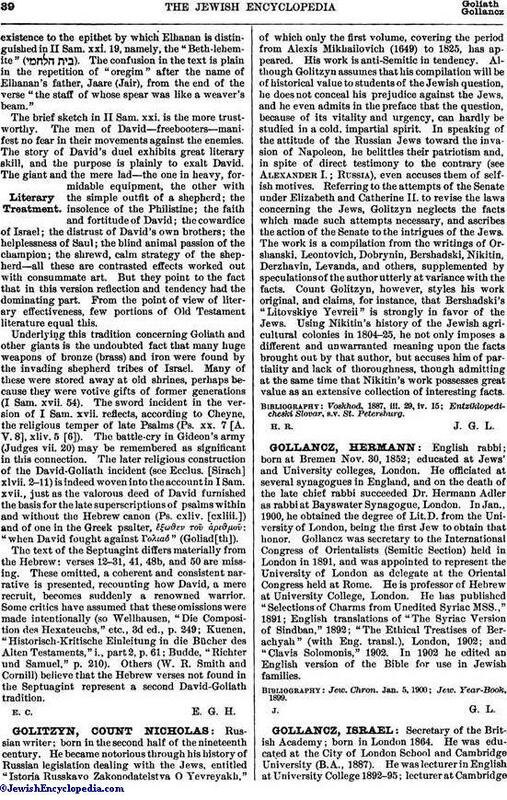 Using Nikitin's history of the Jewish agricultural colonies in 1804-25, he not only imposes a different and unwarranted meaning upon the facts brought out by that author, but accuses him of partiality and lack of thoroughness, though admitting at the same time that Nikitin's work possesses great value as an extensive collection of interesting facts. Entziklopedicheski Slovar, s.v. St. Petersburg.